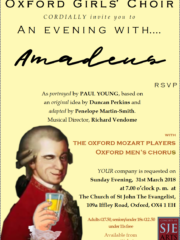 Oxford Girls’ Choir is joined by Oxford Men’s Chorus and Oxford Mozart Players for An Evening with Amadeus, as portrayed by Paul Young, from an original idea by Duncan Perkins. The genius himself entertains us with observations and anecdotes from his remarkable life and work. The evening features performances of some of his best-loved vocal works, and showcases many talented members of Oxford Girls’ Choir. 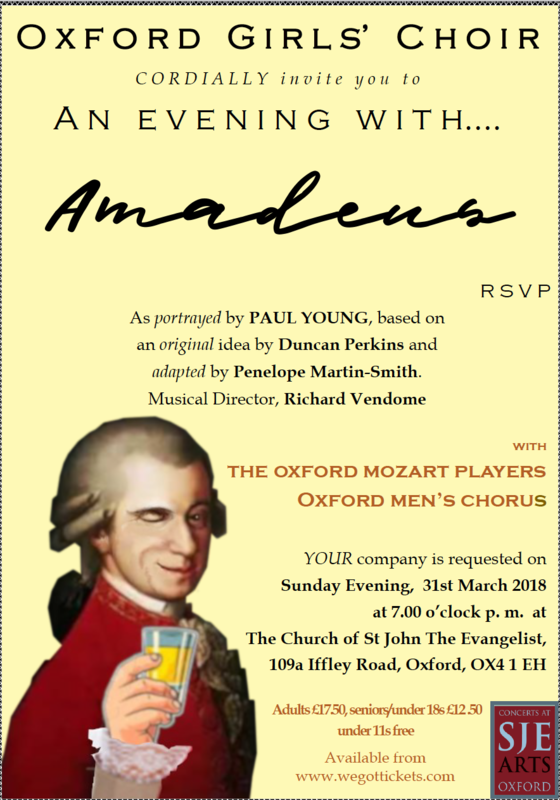 Including extracts from Figaro, The Magic Flute, Cosi fan tutte, C minor Mass and the Requiem, as well as some of Mozart’s less well known vocal gems. Performances at 3pm (dress rehearsal) and 7pm.